And here’s my colleague Ethan playing my Switch vertically, too. He’s the better hand model. I’ve played my Switch in TV mode, handheld mode and tabletop mode. Now I’ve got a game that lets me play it like I’m holding an oversized unwrapped candy bar. It’s great. Sure, you can also play the game horizontally. That might even be the smarter, safer way to do it, since you can then hold the Switch with two hands. But I prefer to have the game running in its vertical configuration, which emphasizes the verticality of a game all about plunging ever further down, down, down. You can play “tate mode” with the Switch controllers detached. I guess you could prop it up against a wall while holding the controllers. I was more pleasantly surprised that the vertical mode works with the controllers attached. 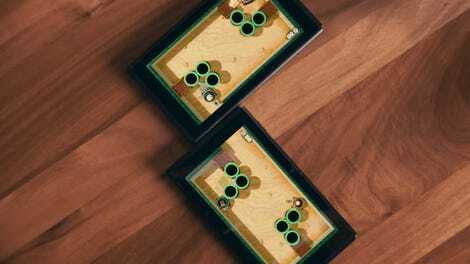 No matter how you play, you use the stick to move your character and a face button to jump and shoot downward. When you’re in “tate mode”, the stick movements are correctly reconfigured. For example, if my left, blue Joycon is at the bottom of the system, then tilting the stick in the direction that would have been downward then moves my guy to the right. You can rotate the game’s graphics either way and use either Joycon controller to play the game. I’m all for game developers experimenting with how our game machines can display what we play. Many years ago, I admired the makers of the GameCube port of the shoot-em-up Ikaruga, which offered a similar 90-degree-rotated mode for people bold enough to turn their TVs on end. I enjoy DS and 3DS games that spread their action across two screens, and I was delighted when I saw how some of the Mario & Luigi games use rotation and a dual-screen display at particularly epic moments in their games. 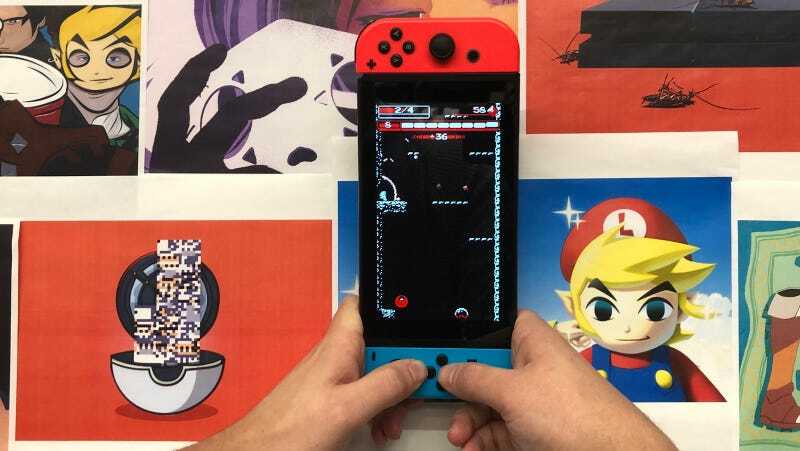 The rotated view for Downwell also reminds me of the funky optional vertical display for DS games on the Wii U’s tablet, which of course then just makes me yearn for some DS games to make their way to the Switch. Here’s to the weirdness of the Switch and the ingenuity of developers making that system all the more innovative with modes like this.